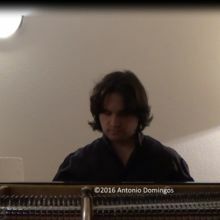 Latest News about Antonio Domingos, concerts, events, new releases, etc. Portuguese-American pianist, born in 1977. Began his musical studies at the age of 7 in his native town of Pittsburgh, Pennsylvania, USA. At the age of 14, in order to further his musical education, he traveled to Moscow, Russia, where he was admitted to the 'Moscow Conservatory'-affiliated Academic Music College, from which he graduated with honors in 1995. In that same year he was awarded third prize at the first International Competition for Young Pianists in Memory of Vladimir Horowitz. In 1996, he entered the Moscow State Conservatory proper, from which he graduated in 2001 with the highest classification, having pursued a degree in piano performance under the tutelage of Dmitriy Sakharov. From 2002 to 2012 he was active as a concert artist in Portugal, where he had settled in 2002. Among his accomplishments are playing Chopin's 'Revolutionary' etude in octaves, thirds, and sixths; playing the 'Chromatic' etude, op. 10,#2 (also by Chopin) in 60 seconds; and giving an integral performance of Liszt's second Piano Concerto, playing the solo part along with a pre-recorded video, performed and furnished by himself, of the orchestral reduction part. Videos of his playing can be seen by accessing his Youtube channel, extremepianochannel, or by copying the corresponding links on the 'Videos' page of this website and pasting them into an address bar. In 2010, he performed a concert dedicated to the bicentennial of the births of Chopin, Schumann, and Liszt.